Economic and financial market “cross-currents” mean the Federal Reserve has adopted a more “patient”, data-dependent approach to monetary policy for 2019 after having raised rates systematically once a quarter through 2018. At present, markets believe that the Fed’s neutral stance will eventually give way to policy easing, with Fed funds futures contracts nearly pricing in a 25 basis point rate cut by the summer of 2021. However, we continue to believe that the next move is more likely to be an interest rate increase. After all, the economy is running strongly with little spare capacity. This is generating rising wage pressures in the labour market, which should keep consumer confidence and spending supported. We hope that positive political sentiment regarding US-China trade relations can be turned into a concrete deal in the next couple of months. If it can, this would be a major boost for the global economy. 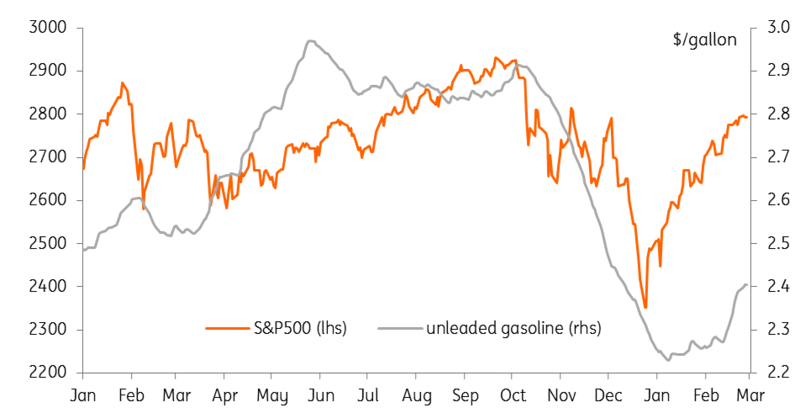 Broader inflation pressures are set to build, too, with gasoline prices now responding to higher oil costs while the pick-up in worker pay and benefits is another contributing factor. In an environment of decent economic performance and rising inflation pressures amidst (hopefully) decreasing trade concerns, we believe the Federal Reserve will overcome its current reticence and hike rates 25 basis points late in the summer. 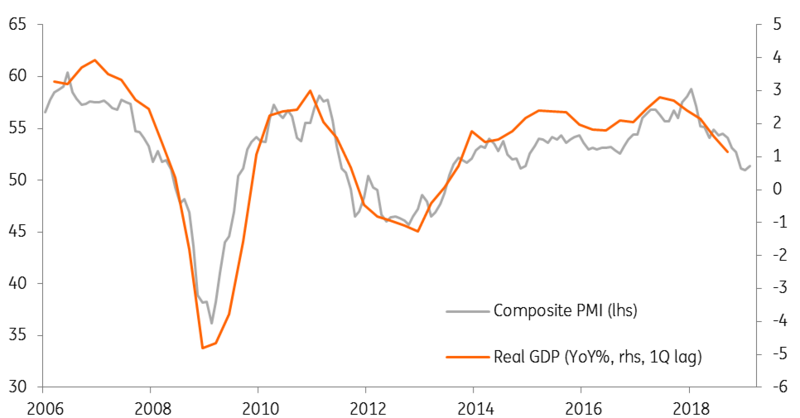 The eurozone is still wobbling between decent domestic demand and increased external risks, and it remains unclear in which direction the pendulum will eventually swing. Against this economic backdrop, the ECB has to strike a balance between overly hasty, pre-emptive action and a wait-and-see approach that could be considered too complacent. In the short run, the ECB will try to buy more time in order to ascertain whether the current downswing in the eurozone economy is transitory or more structural. The ECB’s main interest in the coming weeks will be to ensure that the current monetary stance does not become tighter by accident. New action and tweaks to the communication will be intended to extend the current level of monetary accommodation. In this regard, we expect the ECB to present a package of new liquidity measures and some relief to bank profitability at the April meeting. In April or June, we also expect the ECB to change its forward guidance, suggesting that the main policy rate will remain unchanged “at least until the end of 2019”. While a deposit rate hike could still be part of the “bank relief package” and would be considered a technical correction, the first refi rate hike could come as late as 2021. If a deal is approved and the UK leaves after perhaps only a short delay, then a rate hike could come back into play. A lot depends on how quickly the economy recovers. The scale of the economic slowdown in the first quarter means August may be too early, but a November rate rise is possible. Short Article 50 extension (2-3 months): Unless a deal is agreed quickly, ‘no deal’ fears will quickly return as the extension draws to a close. Article 50 could be extended again, but the ongoing cliff-edge uncertainty means the chances of a 2019 rate hike would quickly fade. Long Article 50 extension (9-12 months): This would provide more of a reprieve for businesses, and the temporary dip in uncertainty could tempt the BoE into hiking rates over the summer. Again this relies on the economy rebounding and it’s equally possible a long extension results in a prolonged pause at the Bank of England. The Chinese central bank (PBoC) has started to support private companies. January saw CNY257.5 billion injected into private firms via the one-year targeted medium lending facility (TMLF). This replaced a one-year medium lending facility (MLF) injection of CNY286 billion in December. The more recent TMLF has an interest rate of 3.15%, 15 basis points lower. We believe that the PBoC will use the TMLF to replace the MLF in 2019, as it will take time for private companies to recover from the US-China trade dispute, even if there's a truce. As expected, the PBoC also cut the reserve requirement ratio (RRR) in January by one percentage point. We forecast three further RRR cuts this year if the economy continues to grow at a slower pace. This will help soften interbank interest rates. We no longer expect the PBoC to cut the 7-day policy rate, as the central government has made negative comments about a low interest rate policy. We have also changed our view on USD/CNY and now expect it to hit 6.75 by the end of 2019. The change is based on the falling dollar index, as well as a hopes of positive progress in trade talks. Having spent many years printing money, running negative interest rates, targeting zero or negative bond yields, and failing to make any notable impression on unrealistic inflation targets, now is the time for the Bank of Japan to think of trying something a bit different. 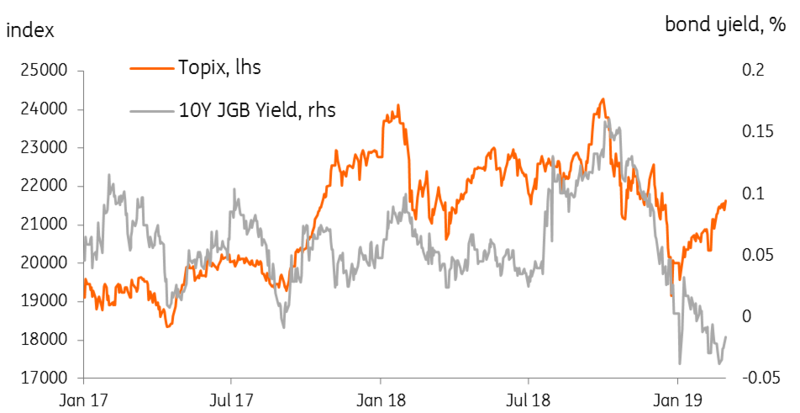 With the momentum still ebbing from this economy, there is a good chance that we see some or all of the policy measures suggested above, though aside from a short-term sentiment- induced bounce, we don’t think markets will significantly respond to these measures, and we don’t think they will have any meaningful bearing on the BoJ’s attempts to hit its inflation targets or stimulate growth. Despite the slowdown in global momentum over the past couple of quarters, the Norwegian economy remains solid. 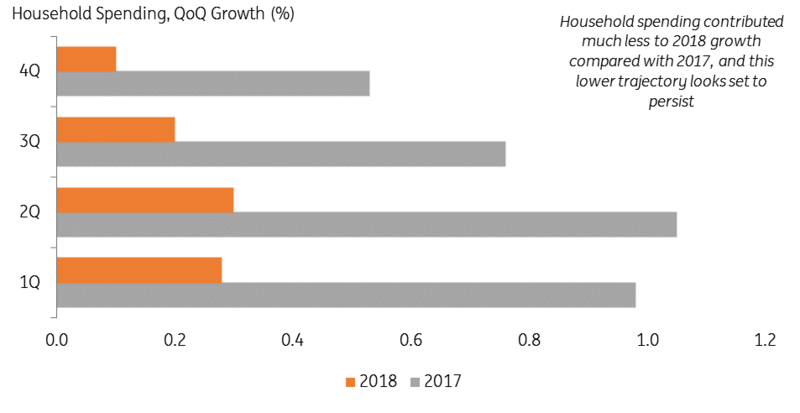 An expected increase of around 10% in oil investment this year should partly offset the weaker external demand, and inflation – already running a touch above the 2% target – will be further supported by rising wage growth and the fact that the Norwegian krone has remained relatively weak. We expect the Norwegian central bank will follow through on its commitment to raise interest rates to 1% at the March meeting. This will likely make the Norges Bank the only G10 central bank to raise interest rates in 1Q. However, the Norwegian economy is unlikely to remain entirely immune from global headwinds. So while the NB is likely to continue to signal another hike in the second half of the year, and we still think that is the most likely outcome, future hikes are increasingly contingent on an improvement in the global outlook. 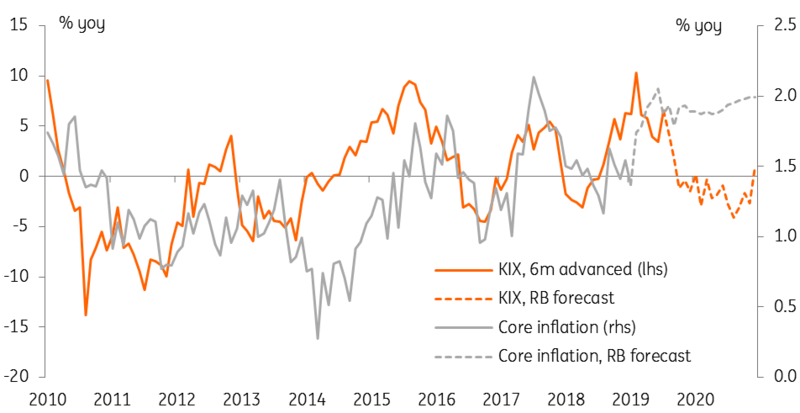 With the Swedish economy now clearly slowing, inflation still anaemic, and the global outlook worsening at the start of 2019, it looks increasingly like the Riksbank’s December hike could turn into a ‘one and done’. 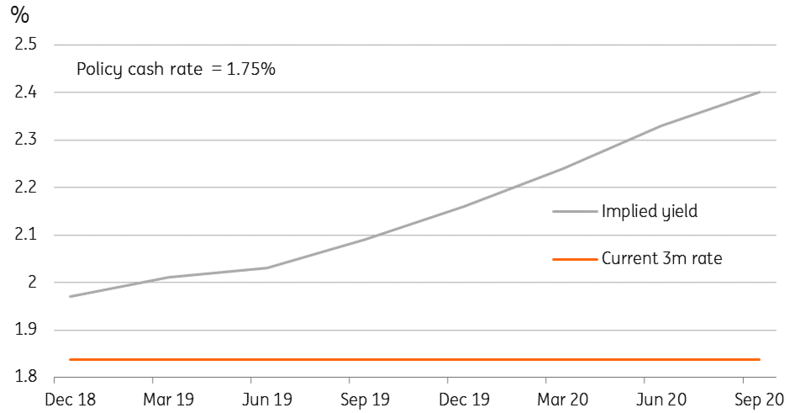 The Riksbank’s current interest rate forecast implies another hike in the second half of 2019, and two more per year after that. On past form, the April meeting would likely see yet another downward revision (the 11th since 2015! ), unless inflation picks up materially in the February and March figures. But the February meeting showed policymakers may be shifting their stance a touch, dropping a long-standing reference to avoiding krona appreciation (the Swedish currency has actually depreciated by 10% over the past year and a half). Comments since the extremely weak January inflation figure also sought to downplay the likelihood of delaying the next rate hike. So unless there is a further deterioration in the data over the next couple of months, we may see a slightly more hawkish stance in April. This would mean keeping the interest rate forecast intact, though we still expect an announcement that QE reinvestments will continue at a reduced rate until the end of 2020. Inflation is still low. 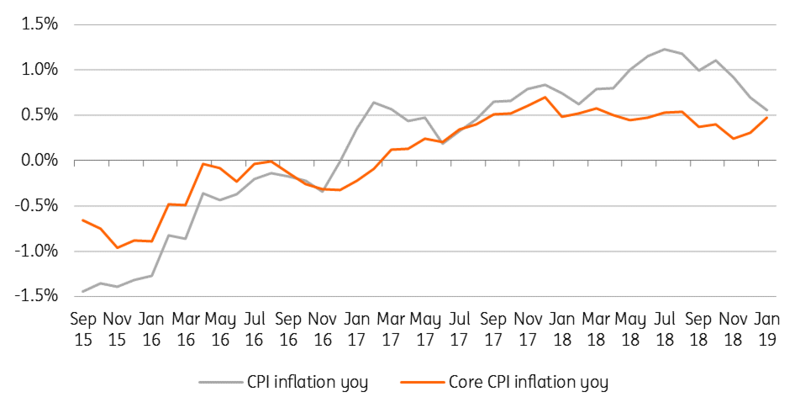 Consumer price inflation stood at 0.9% in 2018, which is still low but the highest since 2018. With the fall in oil prices and the slowdown in economic activity, inflation is expected to remain low throughout 2019 and most probably lower than in 2020. This should not prompt the SNB to tighten monetary policy. The Swiss central bank is actually mainly worried about the evolution of the Swiss franc. At its last meeting, it still considered the currency to be "highly valued". We believe that will still be the case at the March meeting. Indeed, while in April 2018, the franc was trading at €1.20, the currency has since tended to appreciate and is now around €1.13. Knowing the harm that the highly valued franc can do to the Swiss economy, the SNB is seeking to avoid a strong appreciation at all costs. The main policy rate of the SNB will probably remain at -0.75% even longer if a recession looms in the United States and the eurozone by the end of 2020. Over recent months, the Bank of Canada has adopted a less hawkish tone. The committee kept rates on hold back in October, and for the time being, it looks like policymakers will keep it that way. That said, we still expect the Bank to hike rates at least once (if not twice) later in the year. When it comes to economic fundamentals, things look pretty good. A strong jobs market should help support household activity, while the prospects for Canadian manufacturing look decent (away from the energy sector). 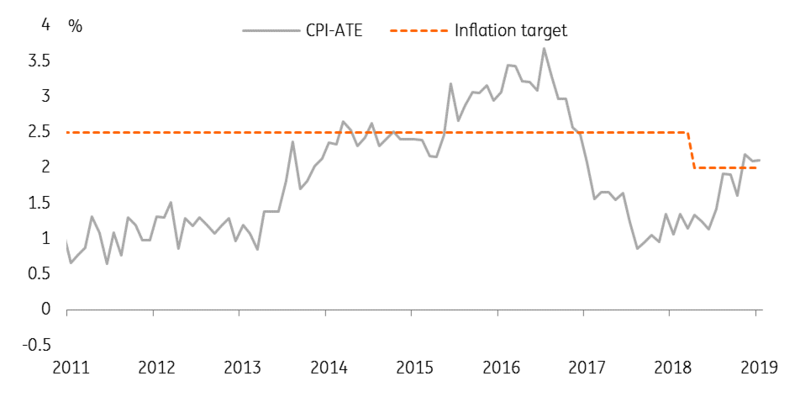 Add in the fact that core inflation looks set to stay around the 2% target, and further rate hikes seem likely. The Australian economic story hasn’t really changed. Bits of the economy, namely the labour market, continue to look in great shape, though there's little wage inflation and it doesn't look as though that will change anytime soon. The corporate sector is sending out mixed messages. Capital expenditure intentions remain steady but sentiment is falling and the housing market continues to decline, although there are no signs of a rout. If nothing else were changing, the RBA would probably continue to sit on its hands, indicating that the next move in rates was up while also hinting strongly that nothing was likely to change for a very long time. The most recent RBA statement and supporting comments from RBA Governor Philip Lowe instead suggest that the risks to the economy are now broadly balanced, and that the next move could therefore be up or down. What has changed is probably the perception of the external economy, with data from around the region, including China, taking a turn for the worse, and exacerbated by things like the Dalian port ban for Australian coal. Bank bill futures have raced to price in the possibility of rate cuts this year. We suspect this will not happen, and that rates will instead stay where they are for even longer. In the background, the decline in 3M USD Libor and associated pass through to Australian bank bill swap rates has done a lot of the RBA’s easing for them, just as the initial increase took away any need to hike. This could go on a while. After a run of surprisingly good data, reality seems to have caught up with New Zealand in recent months. The big dip in the unemployment rate in 3Q was partially revised away, and partially reversed in 4Q18. House price growth moderated, and exports, like the rest of the region, slipped. Governor Adrian Orr has been circumspect about the economy for some time now. The first paragraph of the February Monetary policy statement says about all you need to know: “The Official Cash Rate (OCR) remains at 1.75 percent. We expect to keep the OCR at this level through 2019 and 2020. The direction of our next OCR move could be up or down”. Like Australia, markets are taking more of a bet on rates going down than on going up. But we suspect conditions would need to worsen substantially from here to warrant an actual cut. This might be something to think about in the event of no-trade deal between the US and China. At the moment, the signs are looking more promising, so no cut, and rates on hold for a prolonged time remains the most likely outcome.